It was 29 June and Waterhen was her thirteenth dash from Mersa Matruh to Tobruk. On deck was the usual cargo of tinned stuff, explosives and other stores which on this occasion included jars of acid. The British destroyer Defender accompanied Waterhen and the two ships had been at sea for less than two hours when a formation of about fifteen planes was sighted. 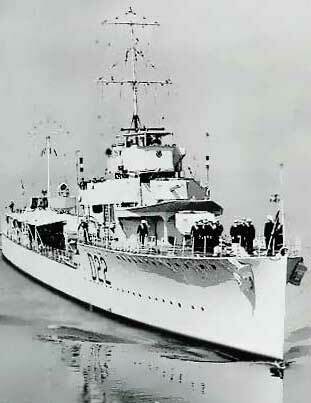 Both ships began to zigzag and the bombers concentrated on the Australian destroyer. The aircraft attacked in groups and Lieutenant-Commander Swain swung his ship rapidly from port to starboard as he dodged the bombs. He had done it before and the gun crew were supremely confident as they poured a hail of fire at their attackers. “Father” would get them through again!d But it was not a direct hit that decided Waterhen’s fate. A bomb struck the water in the swirling wake, exploded in a frothy fountain that showered on the quarterdeck. At the wheel the coxswain, Chief Petty Officer Maurice Cole, found that the steering-gear had jammed. “Ship not answering helm, sir,” he shouted up the voice-pipe to the bridge. Then, as he tugged at the wheel, the tiny destroyer began to alter course again. As she heeled over, almost under full helm, two heavy bombs smashed down into the water amidships. Cargo on deck was hurled into the air. Tins of fruit were smashed and members of the crew were spattered with peaches and pears. On the other side of the ship huge bottles of acid stood unbroken. Ammunition eases slid across the deck. The bombs seemed to burst right over the ship and Waterhen vibrated and shook under the concussion. The engine-room was holed and water poured in until the ship developed a list to port. Cargo on the port side was shifted and Waterhen righted for a moment, then slowly heeled over until she was listing to starboard. The “Chook” was obviously sinking. Lieutenant-Commander Swain ordered “Abandon ship” and Defender ran her bows up to the port side of Waterhen’s fo’c’sle. One by one the men jumped from one ship to the other. Even Stuka, the ship’s dog, was rescued and some men who had been slightly injured were assisted as they attempted to leap from the sloping deck to Defender. Then, as the captain saw that he was the last aboard the sinking Waterhen, he, too, jumped to the British destroyer’s foredeck. The Australians cheered him, for he had saved them on numerous occasions and only his superb seamanship had prevented more serious damage and loss of life this time. “The planes were each dropping five bombs and a drum which looked like a depth charge. Bombs straddled Waterhen and then one plane came down, and let his load go. The bombs fell close to our bows, which were lifted out of the water by the concussion, but if we had not been swinging to dodge the bombs we would have got one fair and square on the fo’c’sle. “Our captain, Lieutenant-Commander Swain, was an expert at dodging enemy bombs by swinging his ship at the right time and before we got our packet he had saved us many times. Petty Officer Liddle said that the last plane of one group dropped the bombs which disabled the destroyer. The pilot came down so low that they thought he would crash on deck and Waterhen was swinging to avoid him when he released his bombs. “One bomb damaged the engine-room, the engineer’s cabin and the central store, and water poured into the engine-room. The port dynamo was blown across to the starboard side. 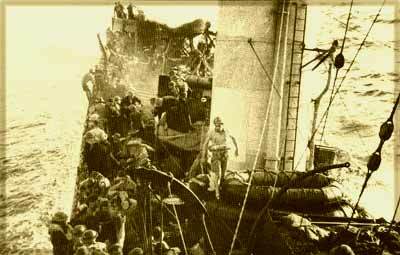 The stores on deck were piled high, and saved many of the men from injury from flying shrapnel. Later Defender returned to attempt to tow Waterhen to port. It was bright moonlight and as the British destroyer approached a submarine was sighted on the surface near the crippled ship. The Italians crash-dived before Defender could open fire and as the U-boat disappeared twin streaks raced through the water directly for the British destroyer. Nothing could be done and the phosphorescent tracks of the torpedoes raced towards them, the deadly “fish” somewhere ahead. But the tracks were within a few yards of the side, now, and there was no explosion. Then, on the other side of the quarterdeck, the tracks appeared again. The torpedoes had passed directly under the rescue ship! Defender by this time was racing in to attack. Depth charges rolled slowly from the racks, there was a series of detonations and then, a few seconds later, there were two more explosions. Defender’s charges had not been too deep! A volunteer crew of ten went aboard Water hen to act as steaming-party and Defender took the Australian ship in tow. For half an hour the tow continued, but Waterhen was listing badly and it was obvious that she had not long to live. Lieutenant-Commander Swain decided to abandon ship once more. So, during the night, Waterhen settled down slowly. It seemed that she was tired of the hectic pace that had been her lot during the past twelve months and, as she gently disappeared, it was somehow fitting that she should rest just off the coast she had guarded so faithfully. Slowly the water rose until the decks were awash and then, with a gentle swish of eddying water that sounded strangely like a sigh, Waterhen had gone. Waterhen’s story is not as spectacular as that of the other four destroyers. She could boast no Matapan as could Stuart and Vendetta, no Calabria like Voyager and Vampire. She was unlucky in that none of her submarine attacks brought evidence enough to claim a definite “kill”, for the Admiralty requires more than just a patch of oil. But she almost cei­tainly sank submarines. In some respects, too, the story of the salving of the tanker Marie Maersk was more dramatic than any battle. “Chook” had done her bit. She was just unlucky. It was not the Tobruk service which held Australia’s interest during those last days of June, however. The loss of Waterhen directed the spotlight back to the North African coast for the moment, but it swung quickly back to the eastern end of the Mediterranean where the battle for Syria was being bitterly contested. Just before midnight on 7 June Australian troops had begun to move across the border from Palestine in a two pronged drive one along the coast and the other towards Metulla. There was little opposition at first, but as our troops moved farther into Syria they noticed a decided stiffening in the French resistance. As far as the Navy was concerned the advance into Syria called for similar support to that which had been given to Imperial troops along the Libyan coastline. The approaches to Saida were bombarded as the Australian troops neared the town on 15 June, the port was taken the same day. There were sweeps, too, in which Stuart and Vendetta took part, sweeps from Haifa along the coast to Beirut. The destroyers found a different Haifa from the lazy port they had visited a year before. Vendetta’s crew still remem­bered their experience when the town was raided for the first time, but they could see tremendous improvements in the defences, and knew that no planes could now approach without warning being given. As they a’~rived with war materials from Alexandria, Haifa seemed to be the same tired town, nestling at the foot of picturesque Mount Carmel. But as soon as they berthed, they could see that it was different. The port was alive, vital. The loss of Greece and Crete had brought home to the people the fact that war was at their doorstep. Haifa was prepared. So, with Stuart, Vendetta moved along the coast sup­porting our land forces until “Cease fire” sounded early in the morning of 12 July. Back to Haifa the destroyers steamed, fuelled quickly, and then left for Alexandria. The Syrian campaign had ended. There was work to be done off Tobruk. Within a few days of the loss of Waterhen, Defender herself was bombed and sunk but again there were no casualties. This time Vendetta was the rescue ship. So the battle to get supplies to Tobruk went on. Two days after she had come from dock Voyager berthed alongside Stuart ready for a run to the beleaguered garrison with the British destroyer Hero. The moon was full, and Alexandria had had more than its share of raids during the previous few days, so the crews of both the Australian ships were a trifle uneasy as the destroyers swung at their buoys. Stuart had returned the day before and German bombers had attacked her ceaselessly throughout the night. It would be bright moonlight for Voyager’s trip, too. Voyager and Hero arrived at Tobruk shortly before mid­night and the first raid started almost immediately. Hero had completed unloading her ammunition, and was just feeling her way between the hulks in the harbour when the Australians heard a plane directly above them burst into a roaring dive. The wind shrieked through the fuselage and, just as the aircraft’s wings were touched with the silver of the moonlight, the bombs came screaming down. Every one on deck dropped flat, some of them beside cases loaded with high explosives. The bombs landed in a semicircle round the ship and shrapnel pinged against the side. The spray had scarcely settled before the crew were literally tossing ammuni­tion into the lighters and, in a matter of minutes, Voyager was steaming out of the port at high speed. But Tobruk was still in sight when one turbine broke down and speed had to be reduced. At dawn the two destroyers were still less than fifty miles from the garrison and at any minute the early morning Stuka patrol would be over. Then on the surface barely a mile ahead an enemy submarine was 3ighted. Commander Morrow could not increase speed and an attack was out of the question—Voyager, the “king sub­marine-smasher” as she was called, could do nothing. Hero dashed in and dropped a number of depth charges which are believed to have sunk the submarine, and then raced back to rejoin Voyager. Morning drew on to noon and still no aircraft had been sighted. By mid-afternoon the ships were past Mersa Matruh; before nightfall Voyager was safely in Alexandria. The Australians paid a tribute to the manner in which Hero had “mothered” them on the hazardous voyage back. Within a week Waterhen and Defender had been lost in those waters. Swarms of dive bombers were expected, but they never appeared. Voyager was able to limp back to port, unmolested, her last mission in the Mediterranean completed. After a complete examination it was decided to send her back to Australia for a thorough refit. By the end of July Stuart and Vendetta alone remained and the flotilla leader sailed from the Mediterranean in August. Within two months Vendetta followed. Four of the original “scrap-iron flotilla” were homeward bound. The other lay beneath the waters of “Cunningham’s Pond”, for victory is not cheaply bought in the war at sea. Australia’s share of the price had been a small one, how­ever. One ship sunk without loss of life and less than twenty casualties in all her other ships this was not much to pay for the sinking of almost a score of Italian submarines, for the torpedoing of two cruisers and the shelling of a destroyer, for capturing and sinking valuable schooners, for evacuating thousands of men and women from Greece and Crete, for running supplies to Tobruk, for shelling enemy positions all along the coast from Sollum to Tripoli. It was not much to pay. But it was paid none the less grudgingly.